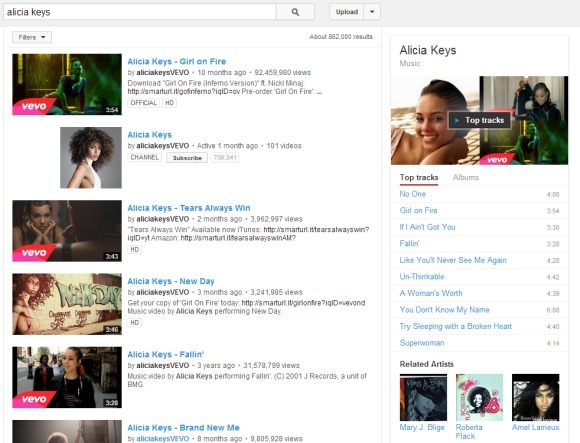 YouTube experiments with a new format for the music artist box. Now it looks more like the Google Knowledge Graph card, it has more pictures, more songs, a list of related artists and a list of albums. Click an album and you'll start a playlist with all the songs from the album. Click a song and you can listen to all the other songs from the artist's playlist. Who needs Google Play Music All Access when you have YouTube? 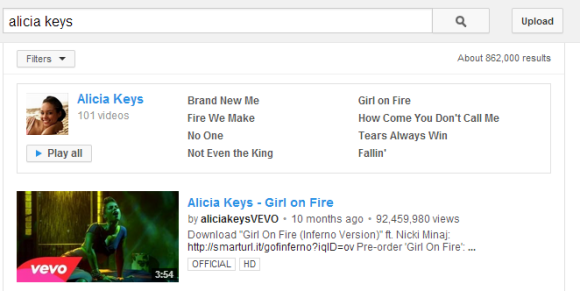 There's also a new YouTube Mix interface that looks more like Google Music's radio feature. It's still a playlist, but it no longer shows numbers, there's an "up next" section, a "next video" button and the end of the list has a fading effect which suggests that there are other songs, but they're not yet displayed.